After more than two decades and 20 million albums sold globally, Counting Crows will celebrate 25 years of making music by hitting the road for a worldwide “25 YEARS AND COUNTING” tour. Counting Crows – Adam Duritz (vocals), Jim Bogios (drums), David Bryson (guitar), Charlie Gillingham (keyboards), David Immergluck (guitar), Millard Powers (bass) and Dan Vickrey (guitar) – have sold more than 20 million albums worldwide after exploding onto the music scene with their multiplatinum breakout album August and Everything After in 1993. 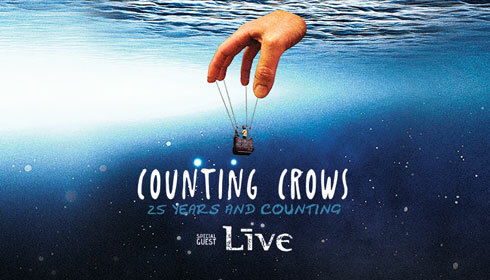 Known for creating unique and innovative concert experiences year after year, Counting Crows is recognized as one of the world’s most pre-eminent touring live rock bands. The band released their seventh studio album Somewhere Under Wonderland in September 2014, which earned critical acclaim as one of the “band’s best,” scored a top 10 debut and was recognized as one of the group’s “stronger works (USA Today),” claiming a spot on Rolling Stone’s Top 50 Songs of the 2014 list with the track “Dislocation”. LIVE, the multi-platinum band from Pennsylvania--Ed Kowalczyk (vocals, guitar), Chad Taylor (guitar, backing vocals), Patrick Dahlheimer (bass) and Chad Gracey (drums, percussion)--have sold over 22 million albums worldwide and earned two number one albums (Throwing Copper, Secret Samadhi). Their catalog is filled with such gems as “Lightning Crashes,” “I Alone,” “All Over You,” and “Lakini’s Juice,” which live on today as classics at rock radio. Throwing Copper produced the band’s biggest single, “Lightning Crashes,” which was #1 at Modern Rock radio for 10 consecutive weeks. Throwing Copper reached #1 on the Billboard Top 200 and eventually surpassed sales of 10 million albums sold with Rolling Stone honoring the album with placement on their “1994: The 40 Best Records From Mainstream Alternative's Greatest Year.” Secret Samadhi (1997) immediately shot to #1 on the Billboard Top 200 and eventually went double platinum. The release of the platinum-selling The Distance to Here (1999) turned LIVE into an international powerhouse and moved the band from arenas into stadiums.